Heroes, Heroines, and History: Rise Up and Walk! This week, I’m celebrating a huge personal milestone. As many of you know, I have dealt with constant back issues since I was assaulted by a patient some 28 years ago. It was my ‘thorn’ as Paul would put it, and after several years of being angry at God, I finally accepted it as part of this race I’m on. But a few years back, the pain increased to the point where I could barely function. Sitting and standing became impossible, and I found myself flat on my back for the majority of my days. I was terrified by the possibility of surgery but when weighted against the unbearable pain, Danny and I decided I didn’t have any other choice. So, today, exactly one year ago, I gave this problem over to the Lord and went under the knife. Which is why I took noticed of the recent obituary of Dr. Jacquelin Perry in the New York Times. Dr. Perry passed March 11th at the age of 94 after a life dedicated to studying the complexities of walking and developing surgical techniques to help polio victims in the 1940s and 1950s regain their capacity to walk. As I continued to read Dr. Perry’s obituary, a fresh sense of gratitude fell over me. 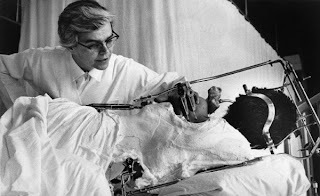 Here was this woman, born in 1918 who pushed aside the expected norms of her day to become not only a doctor, but an orthopedic surgeon passionate for helping those once thought beyond help. Because of her research and work in the fields of polio and spinal fusion, I’m walking and sitting relatively pain free after my spinal fusion, writing my stories and enjoying my life for the first time in years. Thank you, Dr. Perry! Thank you for letting God use you! So thankful for your movement now, Patty! My husband had back surgery several years ago and he is pain-free. A small quarter-inch incision ~ delivering library books one morning in the drop box, the doctor also drove up. I immediately thanked him and commented on the small incision. He smiled, held his hands up and said, "Small hands." So thankful for the specialists and the training in their special interests fields. Wow that is so good to think cos of her work you are now pain free. Thanks for sharing her story and yours. I love to hear historical accounts of strong women who push beyond the norm and are able to do something spectacular. Praise God that through her studies and perseverance techniques have been created to help people who have suffered like you have in the past and praise God you are now healed. Praise God for the progress you made! Patty, I loved your post; so informative and inspiring. I am glad you are better now. I have had painful back, hip issues for several months. Tried chiropractor..then pain doctor, who did an injection. I am some better, but not where I want to be....I was so active (walked 2 miles most days) and never had pain. Without His Grace, I don't know what I would do. So glad to know you're getting on so well. I remember when you had the surgery. Thank God for giving such wonderful talents to people who use those talents to make a better life for others. Dr. Perry was surely one of those. Blessings for a wonderful Resurrection Day my friend. Thank you for your post. I have a great aunt who had polio - she walked with a cane or walker most of my life before going to the wheelchair. This was an interesting article to me. Patty, I am so thankful that you were able to have the surg and you feel so much better now, you have been through a lot and I pray that you get 100% better. I have so enjoyed reading of the women in history and how they did so well in primitive times. thanks for sharing about this dr today. Paula, I love reading about interesting women in history too! In fact, my next LIH is based on a little known military branch used during WWII where every day folks, particularly woman were enlisted as homeland spies! Isn't that cool! My mother-in-law had polio as a child and recovered, but in her later years had to have a brace on the weak leg. We are thankful for people like Dr. Perry who care enough to seek methods to help people get through the difficulties of life with the best result possible. So glad that you were able to benefit from the skill and research of medical professionals and achieve a good result. To God be the glory! Patty, you inspire me with your strength and courage in the face of chronic pain. The fact that you write on schedule is remarkable. I enjoyed this post and your research. All the best on your new books! Inspiring! Dr. Perry AND you, Patty. I am so thrilled that you were able to have this surgery to return to some level of normalcy. I suffer with chronic pain from Fibromyalgia. It is easy to get caught up in being angry and having a pity party. Then I realize I am not alone, and God has a purpose in pain. What a wonderful story, Patty! Thank you so much for sharing. Praise God for giving some people the gift of medicine. I am assuming Dr. Perry was saved. Even if she wasn't, God truly used her. Thanks so much for sharing that bit of important history! So glad your surgery was able to help, and that the pain is much less. I understand how tiring pain can be, as I injured my right wrist in high school, and had pain every day for many years. In 2009 I saw at Dr. at the Mayo Clinic in Rochester, MN. He was able to put an artificial wrist joint in, and while I still have some pain, it is usually after I do things I should not be doing anyway! I Praise the Lord that someone took the time to figure out how to replace a wrist and that Dr. Berger was interested enough, that he learned how to use the device to help others. Thank the Lord for doctors who care! I can't remember ever hearing about Dr. Perry and her work on the mechanics of walking. Thank you for bringing us her---and your---inspiring stories. I'm so glad your surgery was successful and that you are a recipient of Dr. Perry's good work. God bless you. I hadn't heard of Dr. Perry until I read your article, now I want to read more about her. God Bless Dr. Perry and God Bless You too. I hadn't heard of Dr. Perry either but am thankful for her accomplishments. I'm also glad your surgery was successful. Though there are some risks associated with taking farmacia on line. This story reminds me of the Easter episode of The Waltons where the mother struggles with polio. Thanks for the post. Interesting information and a tribute to someone who really made a difference for so many. Patty, I am so thankful that you are more comfortable and are able to do what so many take for granted. My aunt had polio when she was little and always walked with a limp, later she even broke her hip but she NEVER let any of this slow her down or hold her back in life. Inspiring blog - we often take our health for granted until we no longer have it, thankful for those doctors & nurses that help us when we need it. Meanwhile, I wanted to focus now on your uplifting message about the self sacrifices the Dr. Perry made in order to attempt to help countless lives both during her lifetime and afterwards!! What an interesting history to read,... as I have oft wanted to study more about Watson & Crick who alongside Rosalind Allen discovered the helix in our dna, as much as Einstein helped reshape our thinkings on the cosmos and the universal language of mathematics, and dear Madame Curie too! I love research men and women who gave their lives over to science in the hope to endeavor to leave behind legacies that would endow all of us to lead better lives by not only what they learnt but the complex truths of how our bodies can heal!! I appreciated your honesty and your ablity to bring Dr. Perry into the forefront of our eyes! Many, many continued blessings to you, as you go forward with a life in less pain than what was becoming the norm! Chiropratics have been in my own family for years, due to various tendencies to pull muscles or nerves -- I hope one day my Dad will walk with less strife as his chaotic schedule and hours on the road has wrecked his body from that of his youth! Thank you for giving such a powerful testimony on how we can all physically change for the better and how our bodies are as resilant as our faith! Thanks for sharing your story with us.....May we continue to trust God with our health and uplift in prayer the men & women who help us maintain our health.